The new Martin MX-10 Extreme takes a dancefloor classic and reloads it with a powerful infusion of engineering excellence and design and technology, creating a versatile tool for a huge range of applications. The latest in Martin’s popular MX series, this high-octane performer wields unrivalled brightness in a 250-watt package. A complete optical redesign achieves superb picture quality along with maximum optical efficiency. A multi-layer dichroic reflector minimizes thermal stress and delivers a beautifully even beam with smooth color distribution. The MX-10 Extreme breaks new ground in speed and smoothness. Advanced new motor technology has resulted in improved, faster movements across all functions: pan and tilt, color and gobo rotation, prism and shutters. For added flexibility, prisms, gobos and colors are all replaceable, so that MX-10 Extreme can be tailored to a wide variety of environments. A combination of mechanical and design factors coincide to reduce noise emission to the comfortable levels demanded by theatres and studios. 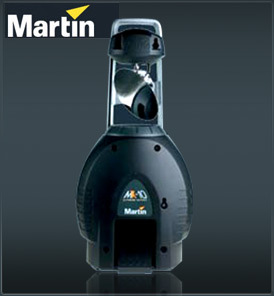 Easy access to lamp and parts make MX-10 fast to clean and service.